Commercial and industrial insulation material availability was taken for granted for decades until two catastrophic fiberglass manufacturing facility fires occurred in February and May of 2003. The instantaneous loss of industry capacity created a disruption of supply, not only for the fiberglass segment, but also for manufacturers of alternative materials as they stepped forward to fill the supply void. Within a few months of the fires, the entire industry felt the financial and operational impacts. Many lessons were learned. The availability of insulation materials may never be taken for granted again. All manufacturers or product lines have extended lead times, planned availability or even allocation at one time or another, for a variety of reasons. However, in the past they were usually short-term in duration, weeks or months versus years. Those situations challenged relationships but were generally viewed as troublesome yet manageable. The supply void created by the 2003 fires may have changed the way many examine supply-chain alliances and their views on demand versus capacity. As with so many catastrophes, the primary focal point of ensuing discussions related to the hardship caused by the fires. Yet while many individuals and companies incurred some degree of hardship, credit is due to those who stepped forward to address those hardships in a responsible and professional manner, including the two manufacturers, the employees and the families who suffered the personal impact of the fires. The industry responded in a proactive, forward-thinking manner. The strength and resolve of the commercial and industrial insulation industry was evident. Immediately following the fires, many of those involved in the industry began asking for statistical data related to the current and anticipated demand for insulation materials versus manufacturing capacity in the United States. They were surprised to discover that information was not historically or currently available in the public domain, especially if multiple materials for similar types of applications are incorporated within the data. The question of demand versus available capacity in the United States is not a simple question–it has many components and a degree of complexity that you would not initially expect. The competitiveness between material groups as well as information confidentiality barriers are certainly some of the reasons why this type of statistical data has not been developed, published and measured on a routine basis. The degree of complexity increases when the geographical scope of the question is expanded to all of North America or beyond. Following are a few examples of these complexities. To determine consumption in the United States, manufacturers would need to track shipments based upon point of use, but most of them currently track shipments in great detail based upon point of shipment or destination. Generally, the point of use is within a 200-mile diameter of the destination location; however, there is a portion being exported by distributors, fabricators and contractors. Is that number significant? It could be, especially for materials that require fabrication, for materials that are not produced in the destination country or for those occurrences when the material of choice is produced in the United States. There are several manufacturers with plants outside the United States that participate in and are major contributors to the market in the United States. Others may supplement their U.S. capacity with materials made outside of the United States. Once again, measurement processes would need to differentiate the point of manufacturing versus point of use. Distributors, fabricators and contractors are also directly importing materials. Is that number significant? Probably not, but it was of significance within the six to nine months following the 2003 fires. Whether or not it will continue is the more relevant question. Over time, the importation of foreign manufactured materials could have a noticeable impact on the U.S. market. Buyers and end-users in the United States are more accepting of non-U.S.-made materials now than in the past. A caution flag should be raised to those individuals and companies that are considering the use of foreign-manufactured materials. They need to ensure those materials are proven, and that their composition, quality and performance standards are measured on the same basis as the U.S.-manufactured materials. Many of the imported insulation materials are on a comparable basis while others may be assumed comparable but are not being measured to the same standards. If those assumed-comparable materials are inferior and ultimately produce a failure, the industry pays the price. While availability and potential economics may support the purchasing decision, assumption of equivalence could offset those values. The wrapper may look the same, but are the application and performance the same or better? When examining industry capacity, there should be a review of the alternative materials available for each particular application or use. That review process was put to task after the 2003 fires. The use of alternative materials was a major contributor to filling the supply void. When considering the dynamics of the market, one could conclude that the only true analysis of demand versus capacity should be by material type and end-use criteria. Simply looking at the demand versus capacity by material type may be too narrow a view. Alternative materials gained market share after the 2003 fires. Will they maintain those gains? Many agree that they will lose a major portion; however, they will yield a net gain. This exhibits the power of specified and traditionally used material. The power of being the incumbent does not only apply to politics. Domestic specification writers, end-users and insulation contractors are historically reluctant to change material preferences; however, many now view alternative materials in a different perspective. This article focuses solely on the commercial and industrial insulation market segments, which some refer to as the National Insulation Association (NIA) world. Many agree that the NIA world does not encompass the majority of the insulation-related activities in the heating, venting and air conditioning market segment. Also, the residential, original equipment manufacturer, automotive, appliance, aerospace and other specialty markets are not generally included in the NIA world. Most insulation manufacturers that participate in the NIA world also support other industry segments, which is not a problem until you delve into market need versus capacity. Simply stated, the issue is the law of supply and demand intertwined with corporate-shareholder objectives to increase profitability. Many NIA-world materials are produced on, or are fed from, the same equipment that produces material for other markets. If the demand is equal to or greater than the non-NIA-world markets, and those products carry a higher degree of profitability, from the perspective of profitability at that manufacturer, it is easy to surmise which material would get manufacturing time preference. This is a good example of why the NIA world should reasonably monitor activity in other markets. It also highlights the competitiveness between market segments. In some instances, NIA-world materials are competing for production time within their own manufacturing facilities. Instinctively everyone wants to sell at the highest price, and conversely, buy at the lowest price possible. Therein lies the age-old conflict that sometimes has consequences for one or more channel participants. In a world where all market demands are relevantly consistent and product-material line profitability between markets is similar, this is not a problem. Where is that perfect world? Although few will openly discuss the importance that all channel participants make a fair and reasonable return on their investment, everyone supports the theory. However, each of these companies operates in a highly competitive environment, often global in scope, which may drive behavior that is in conflict with support of the theory. It is a balancing act for all market participants. This is not new and will not change in the near future. Most in the industry do a good job of balancing these issues within their mutual businesses, but the way businesses are being examined today, both internally and externally, has changed. Those changes may eventually modify the traditional NIA-world buying and selling processes and challenge relationships. Whether those changes are good or bad will depend upon your perspective and the impact they have on your business. Knowledge of these complexities does not answer the question of need versus capacity. If anything, it begs more questions. However, armed with this knowledge, NIA conducted an informal phone survey of leading insulation manufacturers in the commercial and industrial industry, all of which were NIA associate members. The survey included discussion about how best to categorize material groups to provide clarity and meaningful information. It encompassed a wide variety of subjects related to estimates on the current level of U.S. manufacturing capacity currently utilized by material groups, estimated growth rates for 2005 to 2007, and manufacturing expansion or improvement initiatives to meet future demands. The manufacturers who participated were supportive of the intent of the article and the need for the information. Their open-minded and cooperative attitude was much appreciated. A listing of the participating manufacturers is included at the conclusion of this article. Given the complexity of the subject, the diverse approach utilized by the participating manufacturers, and the differences in their core businesses, this author derived an estimate–albeit a non-scientific 30,000-foot-view–on the industry demand versus manufacturing capacity. In summary, there currently appears to be adequate capacity in all material groups through 2007. Tightness of supply and extended lead times in some material groups may occur intermittently. With history as an example, there should be adequate capacity to sustain demand should another catastrophe occur, or if demand estimates exceed expectations–which would be a good problem. The combination of production improvements and expansion initiatives, materials available from foreign manufacturers–many of which are affiliates of manufacturers currently supplying the U.S. market-and alternative material solutions should be more than adequate to fill the respective material group market demands. Examination of the individual material groups supports these conclusions. Calcium silicate and expanded perlite, with an upper temperature limit of 1,200 F, are primarily used in the industrial market and are estimated to be producing at less than 65 to 70 percent of capacity. Cellular glass is used in applications of -450 F to 800 F. As such, it is used in the commercial and industrial markets. Capacity utilization is estimated between 80 and 85 percent. Elastomeric and polyethylene foams are used in the commercial and industrial markets, applications of -70 F to 350 F. The estimate of capacity utilization for this material group is 65 to 75 percent. Fiberglass (sometimes referred to as mineral fiber) has an operating range of 0 F to 1,000 F. To better review the capacity utilization of this material group, it is necessary to categorize the group into segments. Each manufacturer may categorize the segments differently and even add segments. 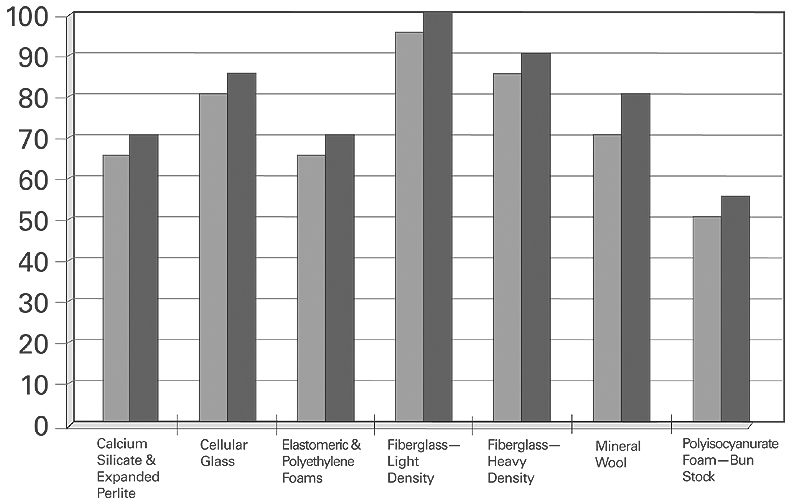 For simplicity reasons and for purposes of this article, the fiberglass material group was subdivided into two segments: 1. light density, which is generally defined to include building insulation, duct wrap, metal building insulation and similar materials; and 2. heavy density, which includes pipe insulation, duct liner, board and similar materials. The capacity utilization is estimated to be 95 to 100 percent, and 85 to 90 percent, of the respective segments. Mineral wool (sometimes referred to as mineral fiber) is used in the commercial and industrial markets with a temperature range of 0 F to 1,200 F. Similar to fiberglass, this group could be broken down into multiple segments. It is estimated that the combined capacity utilization is 70 to 80 percent. Polyisocyanurate and polystyrene foams, with a temperature range of -297 F to 300 F, is used in the commercial and industrial markets. Polyisocyanurate is manufactured in many different forms. The most widely used form in the commercial and industrial markets is a fabricated end-product commonly referred to as "bun stock." Capacity utilization for polyisocyanurate is estimated at 50 to 55 percent. Polystyrene is used in a vast array of markets and is manufactured in equally as many forms. Because of the diverse manufacturing options by numerous manufacturers, it is very difficult to estimate capacity utilization for a single market. It is fair to say that there is more than adequate capacity available. Figure 1 represents the estimated current manufacturer capacity utilization range for a variety of materials. Each manufacturer’s capacity utilization may vary from the listed range. The capacity utilization percentages are intended to represent an industry estimate at a given point in time. Estimates could easily vary from month to month. The next part of the equation is, what are the projected growth rates for each of the material groups? Is there sufficient capacity available to supply the demand during the next three years? Projected growth rates vary, sometimes greatly, depending on who you ask, what data you rely upon and from what perspective you are preparing the information. As usual, any growth projections include a long list of caveats and can vary widely by geographical area. The projections discussed herein are no different. The usual listings of caveats apply, and the projections are broad-industry-wide in scope for the U.S. market. In reviewing forecasts from several economists and construction forecasting organizations, growth "interpretations" could be drawn for specific market segments, such as the ones shown in Figure 2. There are other market segments that are not shown. It is worthy to note that there are many definitions of market segments and what comprises each segment. Dollar growth is projected to be 2 to 4 percent higher than unit growth, which reflects moderate inflation-depending on how one defines moderate. Based upon the informal survey conducted with the insulation manufacturers, the estimated growth–basically an arbitrary average of the responses–was determined by material group. The percentages shown include some combination of unit and dollar growth estimates. Survey data did not provide enough information to demonstrate an allocation between the two. Some degree of inflation is expected. One can assume it might be in the realm of the inflation rate previously discussed. See Figure 3. A direct comparison between market segment and material group growth estimates is somewhat problematic. Regardless, when comparing either growth estimate to the material available, there appears to be adequate capacity in all material groups. That confidence is further supported by the previously announced capacity expansions and improvement initiatives by many of the insulation manufacturers. The manufacturers are continually examining ways to improve and increase their quality and productivity. There could be some tightness of supply, manifested in occasional extended lead times on some products, and from manufacturer to manufacturer as production lines are taken down for maintenance and during peak demand periods. Considering the previously announced plant expansion or improvement initiatives, coupled with anticipated future gains in productivity in comparison to projected market growth, this author envisions a meaningful excess capacity scenario in late 2006, or early 2007 for some material groups. Will the high cost of energy continue to increase? It may drive inflation, but it will also potentially increase the number of opportunities for insulation. Will increasing interest rates slow construction activity? The housing market could be the lead indicator, if the decline is greater than anticipated, for example. When will material requirements being consumed by China begin to decline? With that decline will global competitiveness increase within the United States? Health care and all forms of energy, oil, natural gas, diesel fuel and gasoline could be the primary inflation drivers. These costs have had an effect on all industry segments, and will continue to do so. Maintenance in the industrial market has been curtailed in the last few years. The return of that market may be critical to the industrial growth during the next one to two years. The United States continues to increase its consumption of energy, which will eventually drive growth in the power segment. Newly enacted and soon-to-be-adopted state energy codes will drive growth through increased insulation thicknesses. Private energy conservation programs will drive the use of increased insulation thicknesses and new opportunities. There is a need for a federal energy policy that provides incentives for commercial and industrial energy conservation. The green movement will continue to gain momentum. With that, opportunities will be developed, and the search for new or alternative materials and insulation systems will increase. Building vacancy rates may undergo renewed examination as the at-home workforce continues to increase. The environment and pollution control will once again begin to take center stage in many markets, which will create growth opportunities for the insulation industry. Mold removal and prevention will continue to drive growth opportunities. Global events have an increasing impact on our industry every day. In summary, looking past the numbers–if that is possible–those interviewed felt bullish about 2005 and 2006 while a few concerns were voiced for 2007. The opportunities are abundant. There appears to be sufficient capacity in all material groups, although extended lead times could develop from time to time. The availability of commercial and industrial insulation materials may have been taken for granted in the past. That confidence was shaken as a result of the 2003 fires, which has an impact on the entire industry. However, that confidence has been or will be restored in the near future. All industry segments–manufacturers, distributors, fabricators/laminators and contractors–did a tremendous job in managing a very bad situation, demonstrating the resolve of the commercial and industrial insulation industry or NIA world–a good place to be. 1Note: NIA’s "Insulation Materials Specification Guide" developed for its National Insulation Training Program was referenced to determine the application temperature ranges listed herein. Some material types have been combined for purposes of this article. Each material type may have a different application temperature range. The temperatures listed do not necessarily indicate that a material is appropriate for use within the temperatures given. Specific manufacturers should be consulted for their detailed recommendations.